Filled so full they couldn’t fight. Honey, Raisins, Orange-peel Glaze for Roast Chicken. 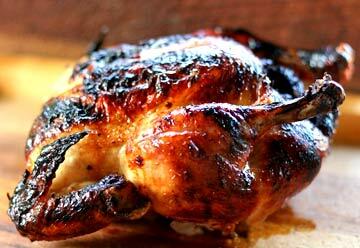 1 Roast the chicken at 350 for 40 minutes. 2. Then brush glazed over the chicken and cook for another 30 minutes. Remove from oven, let cool for 5 minutes. 3. Place the chicken on a platter. Skim the excess fat from the roasting pan and spoon the remainder over the chicken. Serve with your favorite accompaniment.